Climate change continues to have severe and long-term effects on New York City residents. Although all New Yorkers will be impacted, low-income residents will disproportionately shoulder the burdens created by this crisis. Low-income communities sit at a nexus of physical, political, and economic forces that leave them most vulnerable to extreme weather events and other impacts of climate change. 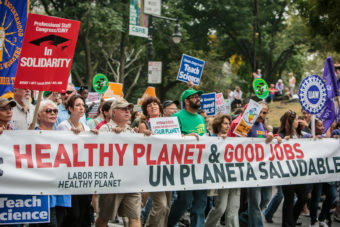 After the 2014 People’s Climate March, community groups, environmental justice organizations, labor unions and other allied advocates joined together to form the Climate Works For All coalition. Our first report, Climate Works for All: A Platform for Reducing Emissions, Protecting Our Communities, and Creating Good Jobs for New Yorkers, details ten proposals to make our city more resilient, create nearly 40,000 good jobs each year, and cut our annual greenhouse gas emissions by nearly 12 million metric tons of carbon equivalent. We are holding the Mayor and City Council accountable for meeting the goal of reducing greenhouse gas emissions by 80% by 2050, achieving zero waste to landfills by 2030, and installing 100 megawatts of renewable energy on public buildings by 2025. ALIGN is urging the City to require energy efficiency improvements in the city’s largest buildings to reduce our emissions, create good, local jobs to address inequality, and protect affordable housing to prevent displacement. Buildings account for over 70%of the carbon emissions in NYC that cause climate change. When we turn on our lights, use hot water, heat or cool our homes, workplaces and other buildings, and charge our phones, we use electricity, natural gas, and/or oil. We must upgrade the already existing 1 million buildings in NYC and continue to make buildings more efficient. ALIGN’s 2017 report The Trump Family’s Dirty Buildings demonstrated that some building owners have taken the initiative to invest in energy efficiency upgrades. For example, the Empire State Building cut its energy use by 40% – upgrades which will save the building $4.4 million a year. The changes included upgraded windows and radiators, building system control improvements and advanced lighting. On the other hand, buildings like Trump Tower in midtown Manhattan uses more energy than 93% of large residential buildings in the city. Only mandatory upgrades will ensure that all building owners take the necessary action. Seeks to transform the way that New York City transitions to a renewable energy future. The coalition launched the campaign with a white paper report, Restart Solar: How NYC Can Restart Its Solar Program to Benefit Workers and Community, to call for changes to the city’s public sector solar program that will directly result in investments and benefits to working people and our communities. 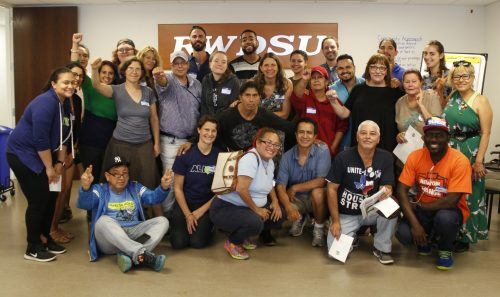 In its second report, Restart Solar: Energizing Environmental Justice Communities“, the coalition makes recommendations on the siting of the city’s solar installations. Climate Works for All continues to meet with DCAS, the city agency that oversees installations, to stay on top of implementation. Create local hire programs and pathways to apprenticeship and civil service titles that connect city residents to well-paying jobs. Share energy savings from solar installations with the communities and/or sites in which the projects occur.